How many different ways are there to make an English Trifle? Probably about as many ways as there are people willing to give it a try. The ingredients for a trifle can vary widely. Perhaps the only essential ingredients are sponge cake and fruit. I actually made three variations of trifle this week and I don't think I have even scratched the surface of all the possibilities. I described my basic sherry trifle above. I also made a second trifle with gelatine, light cream, fruit and sponge. It was quite different, but still quite delicious. 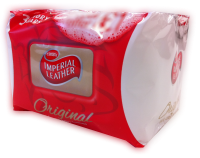 Gelatine (e.g. Hartley's Strawberry Jelly) is an optional ingredient in trifles so I missed it out in my third trifle variety. 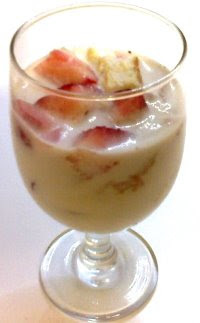 I simply mixed sponge cake, strawberries and Ambrosia Devon Custard to make a very tasty simple trifle much like the ones sold at my local supermarket. 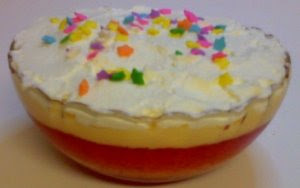 I believe the essential design specification for an English Trifle is "layers" and lots of them. We'll come back to trifles again in the future after I have perfected the recipe for my own multi-layer rich and creamy trifle. I hope you weren't planning to go on a diet. PS: You can also buy a pack of Bird's Trifle Mix at Blighty's Tuck Store. Everything you need to make a basic trifle is in the box. I have two ways of making trifle and both quite different to yours. Chris’ family (Yorkshire) prefers a tin of mixed fruit with a red jelly base with ladies fingers soaked in sherry, topped with thick custard. My George family from Portsmouth prefers a base of jam Swiss roll cut into 1 inch pieces, soaked with tinned cherries or raspberries in their own juice, a drop of sherry, with a little jelly or none (either works)! Topped with a thin layer of custard (set, not runny from the tin), then finished with heavy whipped fresh cream and grated Cadbury’s chocolate or sprinkled flakes!!!! Are you aware that our whipping cream is about 33%, whereas UK whipping cream is about 83%!!!! We get there, but it certainly takes a lot longer! As I lived my first 40 years in UK, I am very much your traditional UK cook – I also have all my mum, my great aunt’s and my nanna’s cookbooks from the early 20s to 70s! Shout if you need a variation on a subject or any ideas… always willing to help. What's On Ontario - the website to watch!